Collections of Cultural Heritage are by no means limited to two-dimensions, our Archives and Museums are filled with three-dimensional objects of cultural and historical significance. The types of objects we encounter and protect are vast and varied, from small scale archaeological artefacts, tools, sculptures and obsolete house hold items to large scale skeletons and taxidermy of extinct animals. As new technology has emerged we now have access to a range of tools for digitising three-dimensional (3D) objects, allowing digitisation experts to produce a true digital representation of a cultural heritage object, its scale, the detail and the significance of its tangibility and physicality. With 3D Digitisation technology, an object is no longer constrained to two-dimensional (2D) flat digital representation. An object can be authentically replicated and preserved into the digital world, capturing the scale, spatial qualities and intricacies within the object itself. As with any kind of digitisation, by creating a digital 3D object file there becomes a greater access to the precious and irreplaceable information that an object holds. This process allows an object to be interactive and seen by anyone in the digital world, where previously the object may have been hidden in storage or behind protective glass displays. Creating digital 3D files also opens the door to new and innovative opportunities for enhancing community engagement through interactive exhibitions and displays, in-house, online, or in virtual reality environments. Why digitise an object collection? There is no difference in purpose for digitising a 3D object or a 2D flat item. Irreplaceable information and history can be captured from an object just the same as a 2D flat object that is digitised into a flat image. Preservation, access, management, engagement and learning are several reasons why it is important to digitise an object collection in a 3D format that will enhance preservation and archives management long into the future. What type of objects can be digitised? With 3D object files there is unlimited opportunities for enhancing collection management, access, community engagement, research, learning and curation of the collection. Preservation is at the center of Digital Archive Management, 3D Digitisation can provide a richer and more accurate representation of the items within a collection. Preservation through digitisation can be achieved for objects that may be prone to degradation and/or damage from either time or handling. Objects have a higher risk of damage due to their unique storage requirements and potential difficulties while handling for exhibition and archiving. Objects can be digitally archived and accessed with associated metadata recorded within a 3D file – enriching the knowledge and information about the object. Viewing an item in its digitised format from any location allows Archive Management to take place online and without the constraints of the location of the object, its conservation storage and / or handling requirements. This is very useful for collections that span across large geographical areas, enhancing access to knowledge that can be shared more easily. For example during an archaeological excavation, an object can be scanned and sent directly to a collection management system for instant analysis with other digitised objects. Digitising 3D objects provides access to your priceless collections that can be digitally viewed without damaging the original object. Researchers from anywhere in the world can be given access to an object collection for enhanced research and learning. Analysing objects that they might otherwise never get the opportunity to view and research in person. Objects can be viewed easily by curators for developing future exhibitions and displays, streamlining the research and discovery process. In our Museums we are seeing more and more implementations of technology as there are increasingly new, innovative and creative ways to interact and engage with a collection. Digital objects can be included and viewed within a digital or even online exhibition. Object files can also transform from the physical world completely and be incorporated into Virtual and Augmented Reality. VR is an immersive experience where objects can be interacted with in the context of their native environment or place of origin – enhancing the engagement with the collection and its history. One project of note is the Deep Time Project by the University of Newcastle ITS Innovation Team. 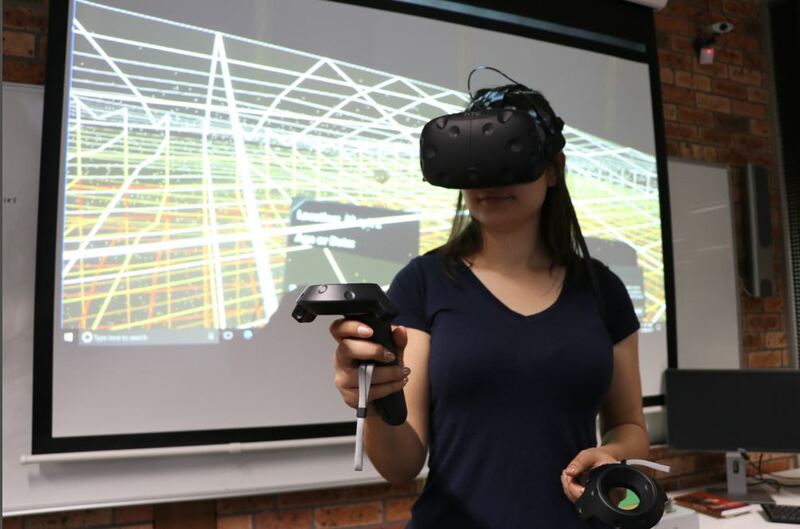 They created an immersive 3D VR simulation of a 6,700-year-old archaeological dig of an ancient Aboriginal factory site uncovered in Newcastle west in 2009. Over 5,500 artefacts were discovered, they were digitised and uploaded into the University’s Recollect site with metadata about where the object was found within the excavation pit. The files were then pulled through from Recollect into an immersive 3D VR experience where you can pick up an item within the ‘trench’ and view the 3D object in your “virtual hand’. A basic 3D model is only a representation of the surface shape. A true representation, however, will require more – its material properties also need to be defined. This can be done in different ways – it could be digitally painted, as is done in 3D modelling software, but for the purposes of cultural heritage imaging acquiring the photographic representations of the material properties at the same time as capturing the surface shape is the desired method. The goal with this type of photography is to capture photographs that represent an isolated material sub-property like colour or reflectance. This can be achieved by careful manual setup of cameras and lighting or specially made light stages, followed by extensive post processing. Once textures are acquired, they must be mapped over the three-dimensional mesh in order to represent the different material properties over the entire object body. The basic properties for any photorealistic portrayal are diffuse, gloss and reflectivity. Other properties can also be captured and represented – glass and similar light-permeable materials can include refraction and subsurface scattering of the light as well in order to appear more realistic. This process involves a handheld scanning device that projects light onto the surface of the objects and captures the geometry and texture image of the surface at one time using software as it is scanned to combine the geometry and image in real time. The scanner has a high-resolution camera (0.5mm) with a 250mm depth of field. This ensures that the texture and image captured are a high quality. Structured Light Scanning suits small to mid-range sized objects and produces a dimensional accurate 3D digital file. This process involves taking multiple scans that are processed in a computer and a highly detailed 3D image is produced on screen instantly. This process is ideal for economically capturing large collections of objects in an efficient workflow while ensuring high-quality files are being produced in enough detail and accuracy for research and learning based engagement. Outsource your 3D Digitisation to our NZMS team using the GoSCAN50. Photogrammetry is the science of making measurements from photographs, especially for recovering the exact positions of surface points. Hundreds of photographs are taken from a range of angles, and using computer software, these are analysed and a point cloud with colour information can be created. This process produces excellent results but is very labour intensive and is therefore more expensive. Please discuss your 3D Digitisation requirements with us to see if this is the right solution for you. There are many 3D file formats that are generated from different 3D software, the list is vast and varied. However, a typical 3D digitised file that is widely accessible in different viewing platforms and software consists of an .obj (object) and .txt (texture) file. A ‘mesh’ or ‘wire frame’ shape of the object is created during digitisation and the textured skin (image) wraps over the object file creating a digital view of a 3D item. Texture resolution is the equivalent of image resolution and the GoSCAN50 ranges from 50 – 150DPI at 24 bits. Once an object has been digitised, the next step is to decide how the files will be viewed and interacted with.